Writing the guest names and their addresses or pasting the stickers on the cards is a clumsy task. We have an absolute solution for this concern. By printing the Guest names on the envelopes, we save your time and energy which is much needed for the wedding ceremony. All you need to do is just provide us the detailed list of guests with their names and addresses, and we will print them exactly same as they are. 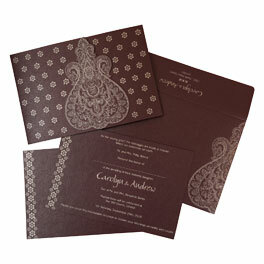 The fonts and the ink color will be perfectly matching the inserts and card, or you can choose your own styles. So for you, everything is at ease. Just get the cards and post them across. @ US $0.60 each This is printed in the font and style that you have chosen to print your text. Everything matching! All you need to do is send us the word file with the guest names and addresses to info@123weddingcards.com and we will take care of the rest. Mention your choice. 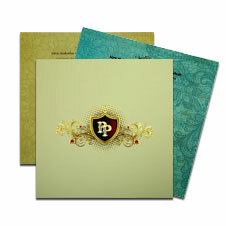 Samples are also offered by us for evaluating the quality of invites, products colors and designs. Total cost for up to 5 samples will be adjusted in the later bulk order placed. Samples are sent blank & for personalized sample with your own text, additional printing charges will be applicable. Bulk orders take 7-8 business days for dispatch after printing & processing, will take another 3-5 business days for shipping worldwide.